I can dare say this has been the toughest year of my life, but it’s also the year that I see the most blessings upon me. Is that even possible? Looking back at my life, I’ve often felt lucky that things often go quite smoothly for me. I got good grades at school. I have a career doing what I love to do. I met my hubby a little late in my life but we really have a good life together despite his parents’ opposition of our marriage. My parents are the best parents one could hope for. I am healthy. We have a remodeled house that we love. The biggest obstacle that I had was a very mean supervisor at my internship who gave me the only B grade in my graduate school career for my performance that was worth nine units out of the 12 total units for that semester. I cried practically everyday going into work being so very miserable. But I knew that once the three-month internship was over, I could pick up the pieces and regain my confidence. So I am so very lucky that things are smooth in my life. I may not be the prettiest. I may not be wealthy. I may not be the most popular. But I have friends and family who love me. I have a stable job and a loving husband. I have Jesus who loves me so. I can’t really complain about my life. Until this year. It. Was. So. Very. Tough. A year ago we attended a couple of IVF seminars and was trying to make decisions in regards to which clinic we should go with. My heart was always so heavy as I was grieving the loss of natural conception. Now that has passed. My focus then was on trying to get pregnant regardless of the means. I knew that having the diagnosis of diminished ovarian reserve is tough, but I often hoped that I would be one of those few people who would get lucky with getting pregnant on the first try. IVF #1 came and passed. The roller coaster ride was nothing that we had ever imagined. Our little Clay is still hanging out in the freezer waiting to be thawed. IVF #2 was such a bust. Four eggs and nothing made it in the end. Couldn’t transfer Clay due to a fibroid that could be in the uterine cavity. IVF #3 yielded one follicle. The IUI that converted from it added to our tally of BFNs. IVF #4 is currently on hold, waiting for the cyst to disappear. After a whole year, no baby in sight. No BFP ever. No two pink lines. No pregnancy symptoms. Not even a chance to transfer one embryo. It was the beginning of the year that I became a Bible study leader for the study of Genesis. That was around the time we had decided to go full force into our IVF cycle. God always has the best timing. The study of Genesis had helped me tremendously during that time. Being a Bible study leader means I have to study each chapter in depth. Studying about Abraham, Sarah, Rachel, Jacob, Joseph, and all the other characters in Genesis put things in perspective for me. They all had setbacks. But God always came through, though not immediately, but always in the end. They were granted promises and held onto the hope. That somehow gave me tremendous comfort. If I didn’t say yes to becoming a leader, I wouldn’t have had the blessings that He bestowed upon me. Being a study leader also helps me focus on others and praying for others rather than focusing on my own life. I have also gained a whole group of Bible study leaders who have been praying for our success in bringing home a baby. When you give up something (your time, energy, etc) for God, God rewards you with more. Now that we’re studying Matthew, I can truly see Jesus’ healing power. The woman who bled for twelve years was healed. The blind man who had not been able to see since birth regained his vision. The lame picked up his mat and walked. Their faith in Christ helped them achieve the impossible. Studying about them and Jesus helps me reflect on my own faith and how my faith can bring about the healing that only Jesus Christ can grant. That is such a blessing that I will not trade for anything else. Throughout this year, I experienced quite an emotional roller coaster, not only in regards to the ups and downs of my cycles, but also because of those who got pregnant around me. I was bitter, jealous, and petty. I was depressed, disappointed, and crushed. I had the why-me mentality and was at one point mad at God for allowing this to happen to us. It was not a good place to be. I know many of you can relate to these feelings as waiting to be a mother and struggling to get pregnant can sometimes do evil things to your mind and heart. I could not talk to people who are pregnant. I could not stand pregnancy announcements. I hid posts on my newsfeed. I walked away from pregnant ladies or mothers and father with babies in grocery stores or shopping malls. This is not unusual or unfamiliar to some of you as you went through or are going through the same. Honestly I didn’t like who I had become. I started to pray regularly about six months ago for joy, peace, strength, and kindness/goodness that can only come from God. And once again, God has shown me His blessings as my heart and mind slowly become at peace with my circumstances and I began to feel happy for certain people in my life and celebrate their successes. I have accepted that this is the path we have been placed and there is a reason for it. It has not been easy to come to this place but I hope I don’t lose sight of God’s blessings to place me there. And then there are my two groups of Face.book secret group friends. They are truly great friends who stand by me during the darkest times, who are there real time writing me messages while I sit in my RE’s clinic waiting for an ultrasound, who check in with me regularly to see how I am doing, and who are so good at cheering me up when times are dark. And then there is this blog that I started seven months ago. Thanks to all of you who comment and support and validate my feelings. Because of you, I don’t feel that I am in this all alone. And then there is my husband. Because of all of the struggles that we experienced together, I see the other side of him. The side that shows strength and resolve at times of crises and challenges. I am sorry that we have to go through fertility challenges together. I wish that we didn’t have to. But if this is our path, I am honored that God has engineered for Bob to be the one who walks through these valleys with me. I am really hoping for good things for 2014. I commented on Maddie’s blog that I dare dream for her to be pregnant and for me to have my take home baby by next Christmas. If it’s okay to dream, I want to dream big. Good that I have her to count on me to have that take home baby. 🙂 I wish you all the best and thank you so much for the care, love, and hugs that you have given me and Bob in the past year. May 2014 be the year that brings joy, peace, blessings and good news to you and me. Vacation in our mini-honeymoon town was wonderful. 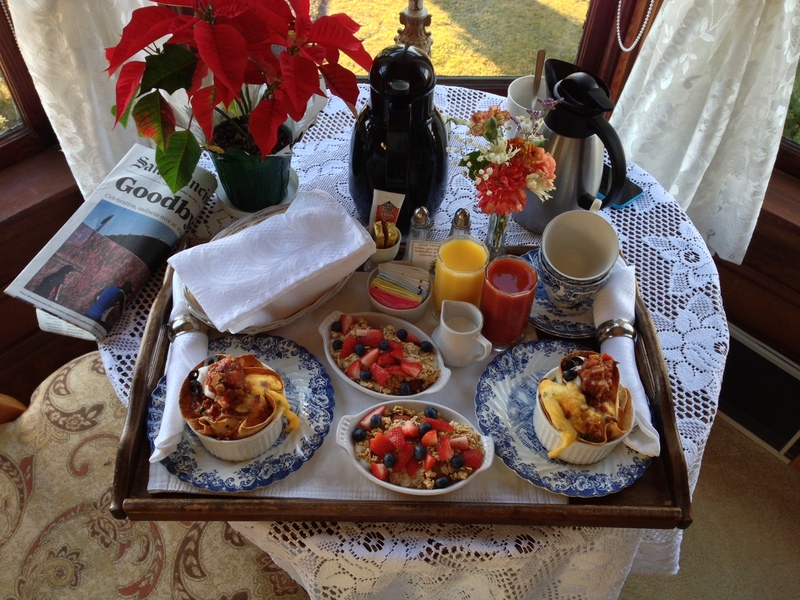 The highlight was having full hot breakfasts delivered to our own room. 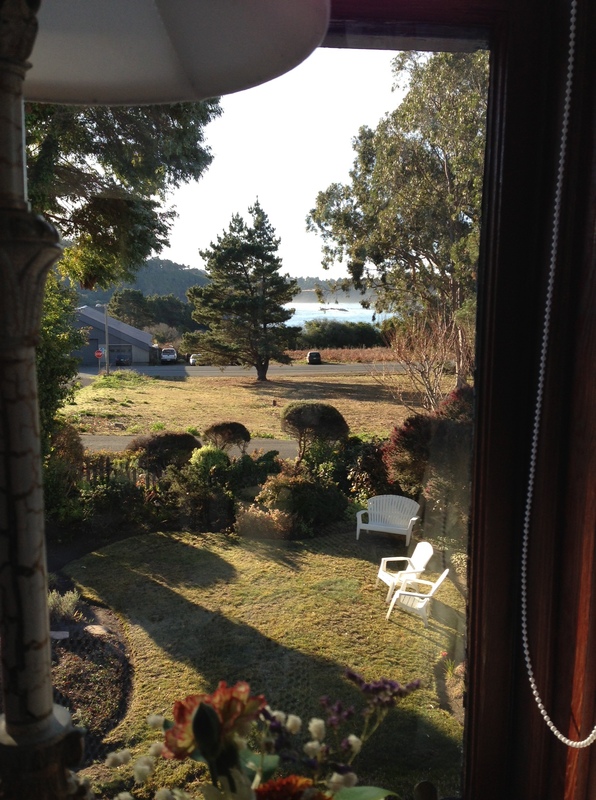 The breakfast table was placed right in front of the bay window that looked out to the Pacific Ocean. 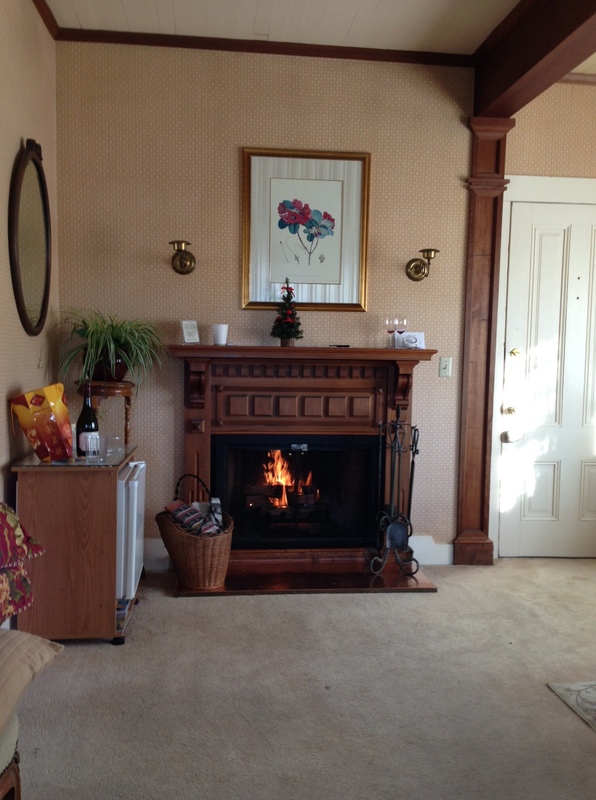 We always had a fire going in the fireplace in the evening and in the morning. The weather was glorious; in the 60s and sunny every single day. We mostly did nothing. We walked around town, had long and quiet lunch, took naps, read books, and hung out during tea time at the bed and breakfast. It was almost everything that we had wanted. Things were wonderful on Monday and Tuesday. On Christmas morning, things were also great before breakfast was served. I had been looking forward to it since the day before because the innkeeper promised that we would have our favorite breakfast at that B&B: stuffed French toast. I sat down at the breakfast table waiting for Bob to be done with his morning routine before we enjoyed the breakfast together. I opened Face.book on my phone. The first thing that popped on my newsfeed was a Christmas card that I had received from a church friend. When I paid closer attention to the words that she typed, my heart sank for a little. She wrote, “Merry Christmas from [her family’s last name]!” Then she listed her husband’s name, her name, her daughter’s name, her son’s name, and also “#3 coming in July”. I overestimated myself. First, I never thought that I would see a pregnancy announcement from her for her number three, let alone on Christmas day. Second, I didn’t think that I would be emotionally affected by it so much. I thought I had become better with pregnancy announcements. Somehow, the combination of Christmas and her pregnancy announcement made it worse for me. It proved to be still tough for me, especially from someone who is carrying her third child. I tried to get better so that our Christmas would not be affected by someone else’s pregnancy news. I was trying to get over it before Bob came out from the bathroom so that my emotions would not affect his. Well, let me just say that things didn’t go the way I wanted. This was how it went down. Bob came out from the bathroom, upset that I got upset over the pregnancy announcement. I claimed that I was trying to get better. Then he told me not to go on Face.book for the rest of the trip. Being someone who does not like to be told what to do especially by my husband, I refused. That led to a little fight. Then he himself got upset that these friends kept on having babies while we struggle to have our first. I got more upset when he got upset. Vicious cycle. When Bob and I fight, we usually get over it quickly and can enjoy the rest of the time within half an hour. This time it was no different. It was done not without a little tear on my part. I cry easily. We were able to salvage our Christmas day and went on to have a very good time going on a tour around town, learning about the history of the town. But, I hate for us to be in that state where we are so fragile and get so affected by people around us. Instead of holding onto God for healing and comfort, we fight each other. At first I thought that our vacation would have been perfect if we didn’t have this fight. I thought more about it. Instead of focusing on the ugliness of the fight, I want to focus on our weaknesses and God’s strength, our bond, and our commitment to each other as well as to our future children. Our vacation and the incident reflect where we are in our journey: we are weak but God makes us stronger and stronger. I hope that this incident helps us to see that relying on God is essential in our journey towards being parents. Avoiding pregnancy announcements may help us have our “perfect” vacation. But confronting our feelings will help us work towards emotional and spiritual healing that could bring total peace and joy for us in the end. One interesting tidbit we learned on the tour is that the wife of one of the founding fathers of the town gave birth to her last child at age 44. It was this child that gave the family offspring and continuation of the family line as the other three children’s second generation all stopped having children. The docent of the tour was amazed at the “old age” of the lady when she gave birth. I couldn’t stop thinking about the friends that I have who gave birth at age 43 and 44 these past two years. I am only 4.5 years away from age 44, and I don’t even have any children at this point. It’s so hard for me to fathom that I am at the tail end of my fertility here. I am sure that no one else was paying attention to that one particular piece of information except for me who is waiting to become a mother for the first time. The rest of the break has been great. I have been reading “The Help” by Kathryn Stockett and really happy that my friend has loaned me this book. I am still reading it but I love the story about the maids in the South and the white people that they served in the 1960s. My other source of entertainment is watching “Dow.nton Abb.ey” on my laptop. In the past few days my head has been mixing with the complex relationships in the South and those of the upper class and the servants in England at the turn of the last century. I really welcome this change of enjoying reading a book and watching some shows as well as sleeping in until 8:30 each morning. On the TTC front, my body is not being cooperative. I started some mid-cycle spotting a few days ago. My RE thinks that it is ovulation bleeding. I wonder if the bleeding actually comes from the cyst. Needless to say, I am a little discouraged by it. I don’t know when I will ovulate so we’ll continue with our intimate sessions every other day until ovulation is confirmed. “Hope” is what I have and what I want to continue to have on this journey. God continues to give me the hope that everything will work out in the end. 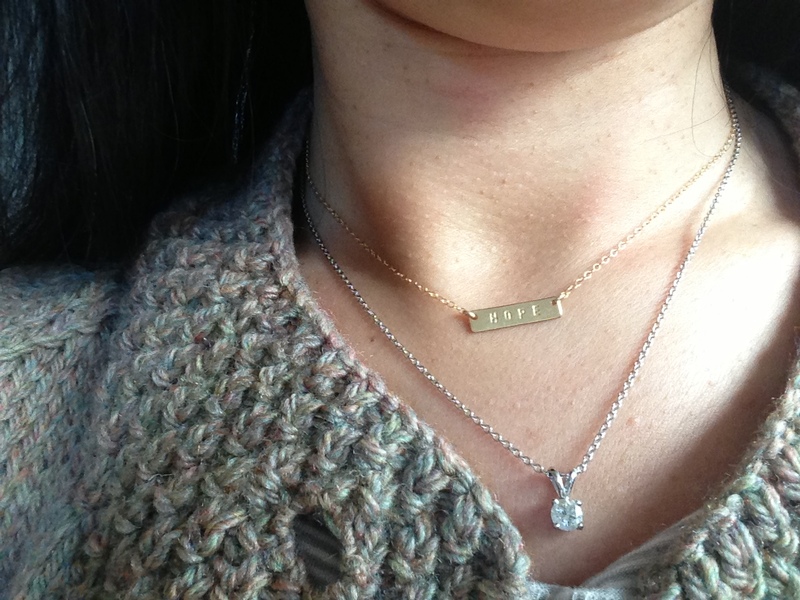 This is just a little reminder for myself as I wear this pendant daily. As we enter into 2014 and the 25th month trying to conceive, I want to hold onto this hope that we will finally be able to experience the joy a child will bring to our lives. Just want to document a few conversations, thoughts, and feelings I have had in the last few weeks. Remember my infertile pregnant friend? She continues to be pregnant (which is a good thing) and send me messages. I have opened up a little more and have asked her more about how she’s doing. I want to be a better friend and am frankly getting better with responding to her. A couple of weeks ago, she was telling me that she was feeling very tired. I commented how this pregnancy has not been nice to her. She said that everything has been fine and she is supposed to feel this way at this stage. Then she went on to tell me the details of how many days of pregnancy she has left and how she’d miss her baby’s kicks because they are really strange but amazing and entertaining. I don’t know about you. I am okay with engaging in a conversation about facts of the pregnancy but… how amazing and entertaining her child’s kicks are? Not the visual I would want. And guess what she asked me next? She wants to do gender selection the next time when she tries for number two. Yup. She’s already thinking about doing gender selection while she is still pregnant with her first baby. She asked me how one would go about doing that. She said they would want a boy next time since she’s carrying a girl. What? Okay. I am not too okay with that question coming from someone who is still pregnant with her first girl to someone who is still struggling to have her first child. I know that doing IVF for gender selection is a very personal choice. I will not judge her for that. BUT, talking to ME and asking ME how she should do that? I guess she doesn’t know that it’s very tough for me to empathize with her at this moment because I myself would just die for A BABY. I am not thinking about if I could have a boy or girl. I just want a healthy take home baby. And yet, she asked ME how one goes about doing IVF for gender selection. She is assuming that all will go well and she will have enough embryos in the pool and they’ll be healthy and normal with both male and female. I know she has tried to get pregnant for four years so she did struggle. But still. I was shocked by that question and the assumption that she makes. At the same time, I am envious of the naivete that comes across. The happiness of being a pregnant lady. The innocence of thinking that IVF will give her what she wants without any problems. At the end of the conversation, she said, “I just hope that you don’t need to go down to Southern California (for another clinic). As long as you are producing eggs, the process will remain hopeful for you.” Yes infertile pregnant friend. I remain hopeful too. The next day, she asked me a question that I had dreaded the most. She asked if we wanted to get together with her and her hubby during the break. I have been hoping that she wouldn’t ask that question. I have not seen her since she got pregnant. There are people that I feel fine hanging out with. Somehow it’s been tough to bring myself to see her. I feel guilty for not being a good friend but she really has rubbed me the wrong way with her insensitive remarks that I just want to avoid her. I didn’t respond to her immediately. I just wanted to think through it. Eventually, I decided not to come clean and just said to play it by ear because Bob has to work and we were still trying to figure out a trip out of town. We left it at that. I know I am not being a very good friend that shows grace. I just don’t feel ready to see her and her belly. The next day, she asked me a bunch of questions about the names of some famous Chinese women. She said she was trying to come up with the Chinese names for her baby girl. Oh boy. I think I had enough on that day. I DO NOT want to be a part of her baby naming process. So I chose to respond some and then kept my mouth shut. I think I need a break from her. I want to talk about a friend of mine. I’ll call her Anna. We’ve been friends for a few years and I know that she’s been trying for a baby for over four years. She is one of those few people in real life with whom I share my story. You know the sense of camaraderie when you’re struggling with the same thing. She is a couple of years younger than I am. Her hormones all checked out. Her husband’s SA was fine. She was diagnosed with unexplained infertility. Periodically we would get together for dinner to chat and update each other on our lives. Bob and I also see her and her husband at church on a regular basis. I know that she had tried one IUI which didn’t result in a baby. They are in the no IVF camp and IUI is the extent they would go as far as fertility treatments go. Right before getting together with her last Friday, I asked Bob how he would feel if Anna announced her pregnancy to me during dinner. He said he would congratulate them and feel happy for them. I don’t know how sincere we both were when we talked about it. I mean, it did cross my mind that she could be pregnant but I was also not really prepared for her pregnancy news since it hadn’t happened in the past four plus years. Came Friday dinner. Anna asked us why we suddenly decided to go away for a few days. So I explained to her what had happened in the last month with the IUi cycle that was converted from the IVF and the Christmas cycle that is never meant to be due to the cyst. After my long explanation, I asked her, “How are you guys doing?” This question was actually loaded. She knew what I meant. She suddenly had this half smile on her face and answered with this drawn out “Gooooood”. In that moment, I knew. And then I scolded myself for being stupid and not really preparing my heart for it. I should’ve prayed for my heart to be open to whatever answer that would come out from her mouth. But I didn’t. I depended on myself. Then I experienced this sudden sharp heartache that lasted for more than a few moments. I found myself asking her, “Is this what I am thinking it is?” She nodded. She was six weeks along. Very early. I am the first person she’d told other than her parents. You know the mixed emotions of feeling very happy for someone that their long wait is finally over but at the same time feeling sorry for yourself that it wasn’t you who could make such an announcement? I know she had been dreading telling me and wanted to see if I had good news to share before she segued into her good news. My heart kept on tugging while I asked her the details about how she found out. Her second IUI worked. She did not expect it to work. There was only one follicle and her husband’s sperm count was 4.5 million, which was way lower than the 300 million that he had the first time (even more than the Angry Birds Bob had!). She went in with zero expectations and was already thinking about trying injections for her next IUI. Here she is. Pregnant at 6 weeks. It really only takes one. I recovered quickly from her news and we went onto have a normal conversation for the rest of the dinner. I even managed to ask her about her symptoms and the other details. Bob, on the other hand, was not doing as well. He responded with “Good for them” and left it at that. I know he’s hurting that we don’t have the same good news to share. It doesn’t really matter if they have struggled like we did. It still stings to be the one left behind. I hope that one day we will be totally free of negative emotions and be able to rejoice with friends who share good news with us, regardless of how long they have been trying. But we’re not there yet. Bob’s Second Cousin had a housewarming party on Saturday. I just didn’t feel like attending this time. It’s more about not wanting to mingle with people that I don’t know than not wanting to hang out with her and her baby. Bob went while I finished sending out our Christmas cards and decorating the tree. I was perfectly content to just have a peaceful night without trying to smile and listen to some strangers’ conversation. Bob came home late that night and told me that he had left his nice down jacket at Second Cousin’s house, some 45 minutes away. So we had to go back there on Sunday to pick up the jacket. Of course we couldn’t just go but to sit and have some coffee and biscuits before we parted ways. No escaping seeing Second Cousin and her baby. The baby continues to be very cute. He woke up from a nap. When I clapped my hands together to get his attention, he beamed with a big smile, extended his arms, and leaned forward to come to me. So I held him for quite some time while he placed his head on my shoulder. He was a good snuggler. Well, then his mom went on to talk about all the gruesome details of her birth and the few days after her birth. To my surprise, I was not that bothered by the details and wasn’t thinking that, well, at least you got a take home baby out of it. This is a huge improvement for me. I was genuinely feeling sorry that she had such a bad experience with the hospital and the doctor at a time when she was supposed to be joyful with her new baby. Finally, I can’t finish this post without talking about my mother-in-law. I wrote about her and my father-in-law here. A week ago, Bob and his mother were chatting on Sky.pe. Afterwards, he told me what they talked about. He mentioned something about his future children and his mother said, “No you’re too old for children.” How about that for a very encouraging parent? She doesn’t ask him about us having children. We don’t share with her because she has a way of telling us off. Her comment confirms to me that we are right not to include our struggles and journey with my in-laws. I’m thankful that my parents and brother/sister-in-law are supportive. I can’t imagine both sides of the family to be this discouraging. I hope that God works in my heart so I don’t feel negative towards my in-laws. Still a work in progress. Here I am on the first day of my two-week break. I just woke up and am in a very good mood. We are going out with my mom to get some dim sum today. It just feels like I can finally relax and not think much about the next cycle or what not because really, there is nothing much I can do in these two weeks. 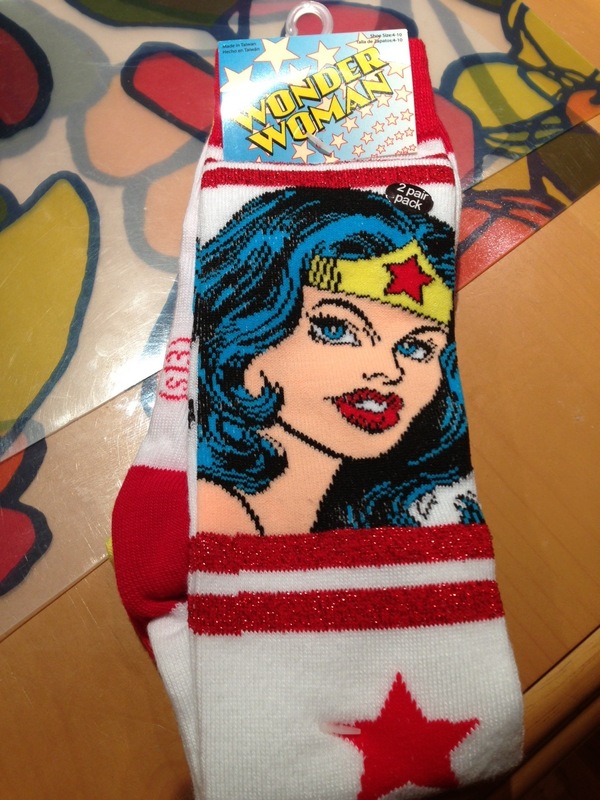 I was totally hoping that I could wear them to get some super power when I go to my first prenatal ultrasound. Well, things didn’t quite happen the way *I* had planned. But it’s okay. I’ll power up next time when I get to my retrieval. Thanks Mrs. Lost! I hope that your little babies are nice and snug inside you! “I hope you find some joy when you look at this hummingbird. 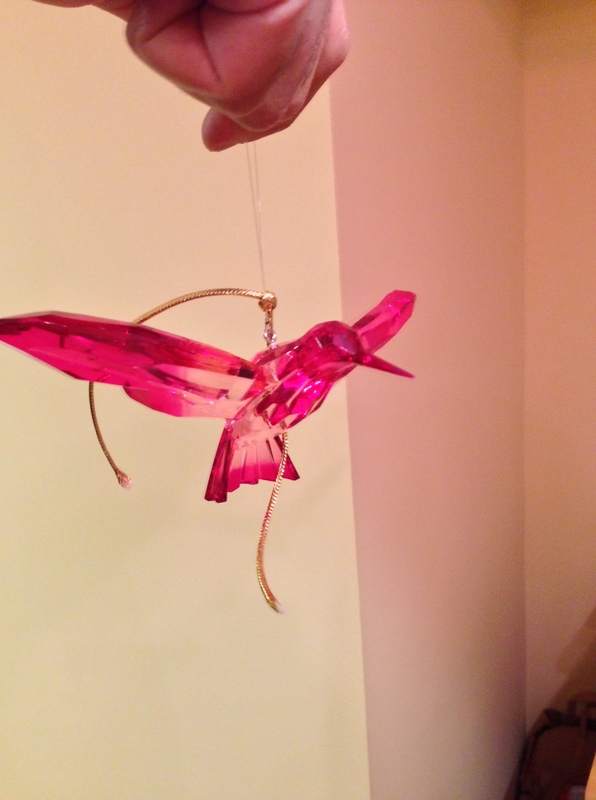 Hummingbirds lift negativity; show resiliency; and are playful. May all your dreams come true!” She is so very thoughtful! Thank you Jennifer! I love love this bird. My mother is SO talented. 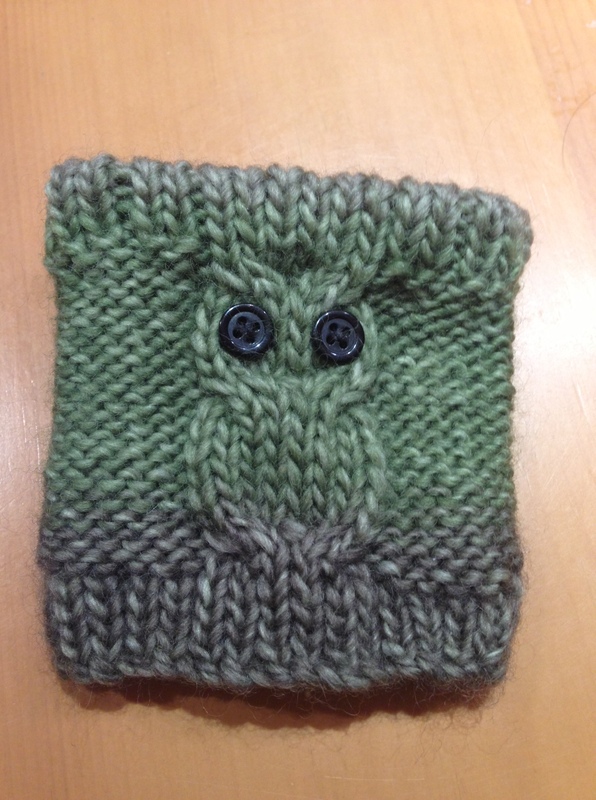 Since I showed this off to many, my mom has made over five of them to give to various of my friends and relatives. She has already declared that this is too boring for her and she’s no longer making them anymore. Bummer. Just want to let her know that I am thinking of her. Each pearl represents each baby. She also lost one baby during this season several years ago. She said she doesn’t understand why this has to be the season of loss. I just really want to wrap my arms around her and let her know that I am here for her. Well, we’re physically too far apart. 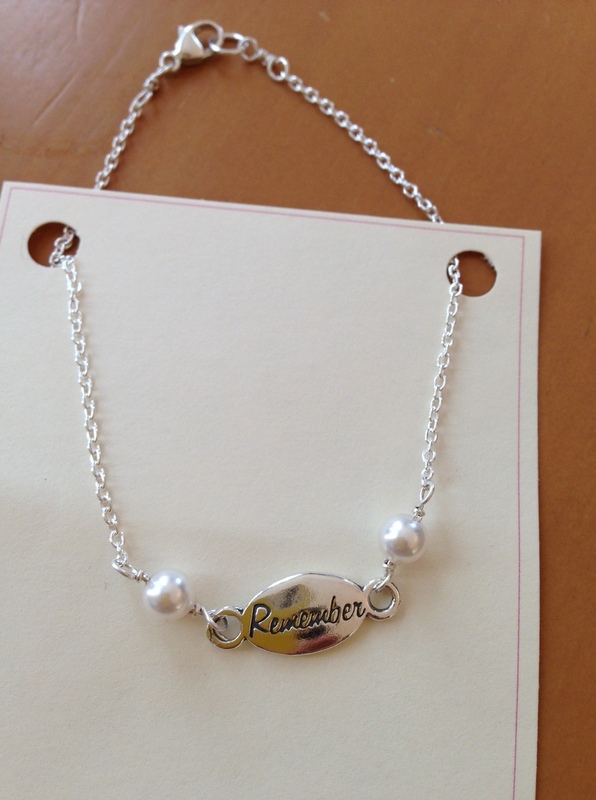 Hope that she finds some comfort in this bracelet. It doesn’t really matter how we have hoped for the best and expected the worst. When the worst comes, the result still stings. I sort of miscalculated when 13 days past IUI was. I thought that it was going to be tomorrow, Friday. Then I realized that it was going to be today, Thursday. I was going to do a home pregnant test on Thursday. The result would dictate the direction of a blood pregnancy test on Friday. Well, 13 DPIUI is today. I was supposed to test yesterday. I chickened out. I would rather not know. So this morning I woke up and got a high temperature. I wanted to be around my hubby when I test so I did it this morning. I pulled out an internet cheapie, dipped it in the urine, and waited for the one pink line to show up. One pink line remained for the whole duration I was staring at the pee stick. My heart did not even skip a beat. It was just like the handful of times I have tested in the last two years. One. Pink. Line. I cleaned up, left the pee stick on the sink, and walked downstairs. Bob looked up from making breakfast. I just said, “Nothing.” He came and gave me a big hug. I wasn’t feeling sad. It was as if nothing was out of the ordinary. I carried on like usual, thinking to myself that I was doing quite well with my emotions. I wrote to Dr. E asking if I should stop the progesterone and aspirin, and to confirm that I indeed wouldn’t need to do a blood test. I left to go to work. I usually pray for the length of time that I drive in to work. I usually pray for other people as well as for me and Bob. Today the prayer was for me and many questions in my head. When are we going to get our baby? How do we keep the faith and hope that it will one day happen to us? What do we do to depend on You, Lord, for our strength? How do I get through the day knowing that we have failed another cycle? Questions questions questions. I am also asking God about my friend who I shared about previously who was pregnant with twins. At another ultrasound it was discovered that she had three heartbeats. A couple of days ago, she lost two of the babies. (If you know me in real life and know who I am talking about, please respect this friend and not to tell anyone about it or ask me or her any questions about it. Thank you.) One embryo was totally reabsorbed and could not be found on the ultrasound. The other embryo measured at 9 week 4 days. She went from two, to three, to now one. I have been so so sad about this news and for her. I do not understand why she has to be given two heartbeats, then three heartbeats, then down to one again. I am full of questions today. I doubt that I will get any clear answers. I wasn’t sad when I saw the one pink line. I started to get sad when I cried out to the Lord in the car. I teared up on my way to work and continued to talk to Him. Although I was sad, I was still at peace and calm. Isn’t that a weird combination? I was sad for me and Bob. I was also sad for my friend who now tries so hard to fathom what has happened and how in the world she is going to hold onto that one baby inside her after losing two. There are just so many unknowns. A little tear was good for my soul. Allowing myself to be a little sad helps me recover from the disappointment of this cycle. I am doing well again. So here we are friends. Stark white strikes again. And what can we do? We just press on and hope that the stark white will turn into a beautiful pink one day. Here we are more than half way through our two week wait. I have to say that I’m doing great emotionally. My temperature has been up, which is not unexpected since we’re just 9 days past IUI. Plus I have been supplementing with one Endometrin capsule per day so I would expect that to have some effect on my basal body temperature. I’m not even sure why I am taking my BBT. What is the point if progesterone supplement will keep it high? I don’t really know. I just find myself sticking the thermometer in my mouth at 5:30am daily. Emotionally, I have been feeling quite normal. I am not anxious about the outcome since 1) we don’t have control over what is going on and 2) I don’t really expect the IUI to work. Don’t get me wrong. I am still not-so-secretly hoping that this is our lucky cycle. At the same time, the odds are definitely not on our side, despite my husband’s surprisingly abundant swimmers. We really need my egg to be good. If my eggs have not been good in the last two years including our IVF cycles, why would I expect anything differently for this cycle? But there IS still hope because in God nothing is impossible. Speaking of the timeline, it has almost been two years since we started trying to conceive. I still remember our wedding night in April 2011 how we naively used protection thinking that we would wait until at least April 2012 to start trying. Little did we know that a major surgery was on the horizon which pushed TTC to start early in January 2012. Fast forward to the current time. As we’re approaching January 2014, I am amazed at how my mentality and the condition of my heart have changed. A year and a half ago, I got the news from my OB/GYN that my FSH and AMH pointed to diminished ovarian reserve and how IVF would be the right thing to do. I came home crying to Bob and thinking to myself that I would prove him wrong. We started to embark on the journey of alternative medicine and Chinese herbs. About a year ago, we finally admitted that natural conception would most likely not be our means of getting pregnant. We anxiously began to research on various IVF clinics in the area and began to attend IVF seminars. At that time, I was grieving the loss of getting pregnant naturally, battling the jealousy and bitterness that I felt, and trying very hard to understand every single aspect of my diagnosis and the best course of treatment for us. I did not have peace. I was anxious and lost. Diminished ovarian reserve is a killer diagnosis. It sounds so so grim and so hopeless even with advance treatment such as IVF with ICSI. I was so afraid of being one of those poor responders that I read about online. I read so many blogs and forum posts and find so few success stories. I felt so sorry for myself that my abysmal antral follicle count would mean not having any embryos to freeze in the end. I was also jealous of people who have many follicles and many embryos, despite the fact that they also suffer from this beast of infertility. Despite our fear and continued grief, we moved full force with IVF #1, which resulted in a roller coaster ride and a frozen embryo. Second IVF with four eggs but nothing to transfer. Third IVF that resulted in only one follicle which leads us to our current situation: post IUI and waiting for the verdict in a few days. I think normally one would be discouraged by the seemingly frequent failures on our part to even make an embryo to transfer, let alone getting pregnant with the embryos. I was blissfully ignorant during our first cycle about the chances of having fertilized eggs. I thought that we would have at least two if not three embryos to transfer on day three. I was a nervous wreck during our second IVF hoping to have one more embryo than the previous time. Unfortunately our embryos didn’t grow beyond day three. Ever since then I have been praying for total submission and trust that the Lord has a plan and a purpose for us and for all that we have experienced. I have been praying for peace of God that transcends all understanding and for God to guard my heart and my minds in Christ Jesus (from Philippians 4:7). I can tell that the peace that I have experienced in the last month has been amazing. I not only feel peace about our situation regardless of the outcome, this peace also spills over to other areas of my life. I have been celebrating friends’ pregnancies and feel truly happy for them. An online friend of mine who had been trying for over two years did her second IVF, transferred three blastocysts, and just confirmed that she has two beans inside her. I normally would feel sorry for myself that someone who is my age could get so many blastocysts out of one cycle while I struggled to hold onto one embryo. Somehow, I am very very happy for her and do not have an ounce of jealousy in my heart. I have been praying daily for another lady in my Bible study group who is my age and about 20 weeks pregnant. I also do not have any jealous or bitterness towards her. I can even tolerate online chats with my infertile pregnant friend without getting too annoyed or offended. I realized that when I am weak and can’t achieve something such as peace and calm on my own, God is THE source of strength and comfort. He has been showing me His power and might in transforming my heart. Really, I cannot do it on my own and I am glad that God chooses to answer my prayers so quickly. I somehow know that we are going to try for a baby for a long time. Twenty-four months (and more than 24 cycles) is a very long time to try to get pregnant. As we approach our second anniversary of TTC, I hope and pray that I will continue to keep this peace as I believe that God definitely has a good plan for us. I also pray that my husband will experience this peace as well. Poor guy. He has not been in a good place emotionally in regards to others’ birth news, pregnancy news, and even IVF news (number of embryos, follicles, etc). Whenever I tell him about so-and-so’s journey or show him newborn baby pictures, he has an adverse reaction to it. I do not judge him as I used to have the same response. I just hope that God’s peace will also come to him so we can both go through this journey together in peace that comes from the One high above. I am not saying that I will not ever feel sad or jealous again. I may even cry my eyes out this coming week if we find out that our IUI is a bust. A normal dose of negative emotions is healthy. But I so welcome this change in my heart knowing that God is compassionate about our sufferings and will give us the strength to persevere. Oh and for this IUI? I am still undecided about testing. I most likely will test Thursday night to determine if we should get a blood test done on Friday. I’ve got to find out when/if to stop the progesterone, right?